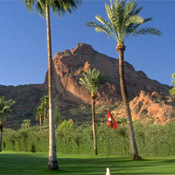 Mountain Shadows Golf Club, nestled in the foothills of Camelback Mountain is one of the most scenic golf courses in the state. This par 56, 3,081-yard Executive course, which seemingly plays directly into Camelback Mountain, is lined with both oleanders and palm trees to guide you through each shot. Twilight golfers can enjoy spectacular sunsets as they finish the 18th hole. Come and experience the greatest executive course in the Southwest. Our signature 12th hole at Mountain Shadows is a demanding 175 yard par-3 that plays uphill directly towards the beautiful north side of Camelback Mountain. Your tee shot will carry a fountained pond fed by a meandering brook. The narrow two-tiered green is well guarded by grass bunkers. Bring your game and your camera for this one!